Built in 1877 as the College Farmhouse, The Maples reflects the university’s heritage as an agricultural college. Initially the building stood on nearly 400 acres of farmland. Faculty and students raised crops for their own sustenance and for agricultural experiments. The farm superintendent originally lived in the house, which was surrounded by several barns and outbuildings into the 1930s. Early in its history, the building was known simply as the Farmhouse. Its name was changed to The Maples in the early 20th century. Following World War I, land for agricultural experimentation was increasingly moved from campus to university-owned farms in Stillwater and Old Town. The university also acquired land in other parts of Maine for specialized farming practices. Farmland on the Orono campus gradually decreased from 370 acres in the early 1880s to 34 acres in 1950. The university administration adapted the Farmhouse for different purposes, including housing for agriculture professors, a campus hospital and a home economics practice house. Part of the building accommodated increasing numbers of female students before Colvin Hall was built in 1930. It was called “Balentine West,” after the first women’s dormitory. Victor Hodgins, an architect from Bangor, prepared plans for the renovation of the building to serve as a women’s dormitory in 1931. 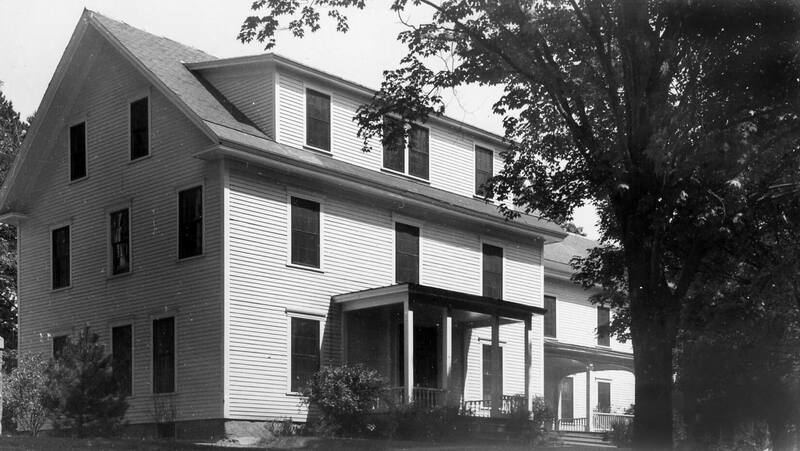 In 1940, Crowell and Lancaster of Bangor renovated the building for offices and laboratories for the Agriculture Experiment Station and the College of Agriculture. The Maples currently contains faculty and administrative offices and a classroom.